It sure is complicated being a teen girl. There's the guy at school who makes your heart pound and the family issues that never seem to go away. Add to that mix the exhausting biology class and life is just plain tough. This is a book about the basics. Using real-life examples and applicable Scripture verses, author Heather Jamison talks to girls about the essentials--rules, rags, and relationships--and how wrong attitudes can be changed into valuable lessons. Just what is "real stuff"? It's all that stuff you have to deal with that can have you tripping all over yourself just trying to stay afloat. It's the basics: rules, rags (clothes), and relationships. Between that guy in class who makes your head spin and parents who seem to have forgotten that your life is your life, things can get pretty rough. 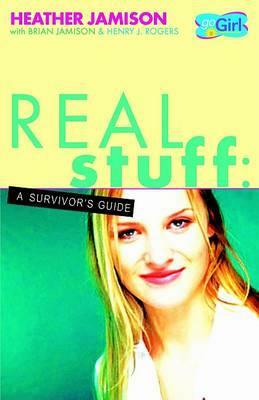 That's why Heather Jamison has written this survivor's guide--to help you survive! Going straight to the Bible AND using her own experiences, Heather offers advice on life's essentials--rules, rags, and relationships. Her husband, Brian, and friend Henry Rogers chime in to offer a guy's perspective, and dish up just about everything you've wanted to know about the male mind. Basically--life can be tough, but no one has to go solo! "Real Stuff speaks straight to teen girls in a personal, sit-down-and-have-a-soda-and-we-can-talk kind of way. . . ."
"Every teenage girl needs to know she is beautiful, that she is loved, and that her worth comes directly from above. That message comes through loud and clear in Real Stuff!" Henry J. Rogers is the Corporate Chaplain for Interstate Batteries in Dallas, Texas. He serves on the President's Council for Dallas Theological Seminary and on the boards for World Impact-Dallas, Children's Hope Chest, and as chairman of the board for Probe Ministries. He is the author of The Silent War--a book intended to encourage moral purity.